I have high efficiency toilets that have groves that 'shoot' the water around the bowl to self-clean with each flush. While they work well, they still have to be cleaned. The throat of the bowl at the bottom, is small and narrow. Up to now, I had to put on gloves and clean that area with a sponge because no toilet brush could get down there. Then I found this toilet brush and it was game on! It reaches all areas of these toilets, from the groves to the throat and cleans them all. I was unsure of the lack of bristles but soon found out that they were just not needed. 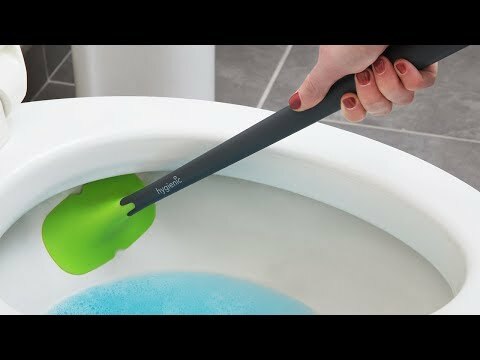 This brush seriously cleans the bowl quicker and cleaner than any brush I have tried. And then it hangs on the wall in it's container, as neat as can be. 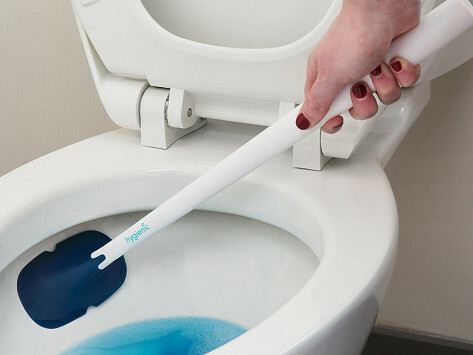 No more getting knocked over onto the floor, spilling water everywhere from the run off of the bristles! Because there is no bristles, you have no held water to drain. It does not drain down your wall from the wall mount either! Really a very best buy you can make. 3. Stays clean. No rusty brush tips. I like using. this and find it easy and effective. I only gave 4 stars as I do not like the holder that it comes with.